Every now and then, you need to give your car a new lick of paint. Perhaps you fancy an entirely new color scheme, or you just want to give it a fresh coat, so it looks good as new once more. The problem is that professional paint jobs will cost thousands of dollars! For some people, they’re better off just buying a new car. If only there was a way to give your automobile a professional paint job without needing to spend all that money. Well, there is, and it’s all thanks to automotive paint guns. With a product like this, you can easily paint your car without breaking the bank. The best thing is, you only have to pay for the gun once, and then you have it for a lifetime. With the right tools, there’s no limit to what you can do to your car! Devilbiss is one of the most tried and trustworthy brands in the industry, and this product is part of their new HVLP Finishline 4 Series. What does that mean for you? Well, you get one of the best automotive paint guns for beginners that’s packed full of the latest and greatest technology. It’s not one of the most expensive offerings either, which is why it’s your ideal product for a first-time buyer. You get multiple fluid tips in the package as well, so you get to enjoy more variety when spraying. When it comes to painting, the precision machined air cap, and fluid nozzles allow you to see some of the best results around. You can be extremely accurate, even if it’s your first time ever using an automotive paint gun. A standout feature is the new atomization technology, which essentially refers to how the paint ‘sticks’ to your vehicle. The atomization is so good that you won’t experience wet or running paint – it just lays down and sticks right away. It has a gravity feed as well, which basically means the paint flows down through the gun, which prevents instances where the spray stops and starts. All in all, a very good product for beginners, and at an attractive price too. All internal passages are anodized and the anodized body makes it easy to clean. If you’re really looking to take a dive with your automotive DIY painting, then this is a fabulous offering from TCP Global. As you can tell by the name, this isn’t one single product, but a set. 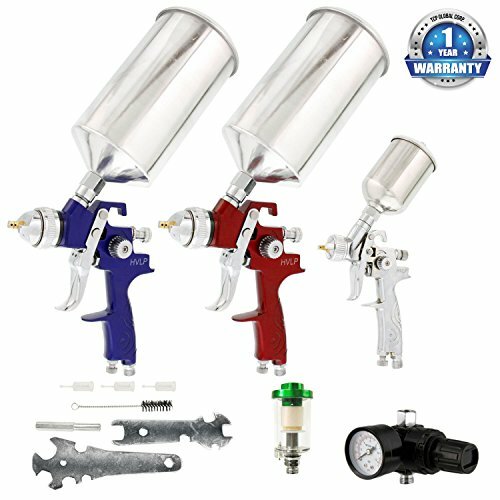 In total, you get three very high-quality automotive paint guns of different sizes. One has a 1 mm fluid tip, the other 1.4 mm, and the third 1.8 mm. You also get a maintenance kit as part of the package, which is a welcome sight as these products do need to be cleaned and maintained to ensure they operate well in the future. To complete the set, there’s an air regulator. Each product in this set serves a purpose, with the larger models being great for more extensive surface areas, and the smallest one being ideal for touching in very tiny areas with extreme precision. There are knobs that you can use to adjust the spray patterns as well, and it’s entirely atomized to create the perfect finish on your vehicle. Many customers considered this to be the best automotive paint gun for beginners as it gives you everything you need in a package. There’s no need to go out and buy anything else; it’s all there for you to use. You can get some really professional-looking results as well, and it’s not even one of the most expensive products out there! 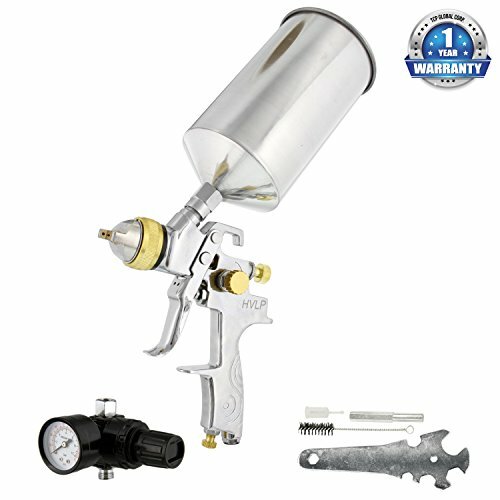 Spray the Full Spectrum of Coatings Using this Quality 3 Gun Set of High Performance HVLP Spray Guns. You Get All the Premium Features and Benefits, without the Premium Price! 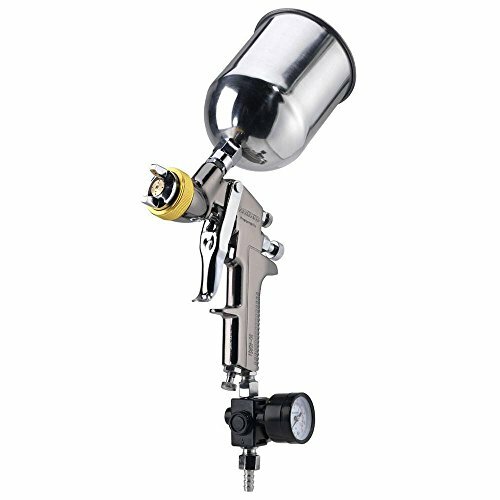 The 1.4 mm Fluid Tip Gun is Ideal for Base-coats, Clear-coats and other Light to Medium Viscosity Materials. 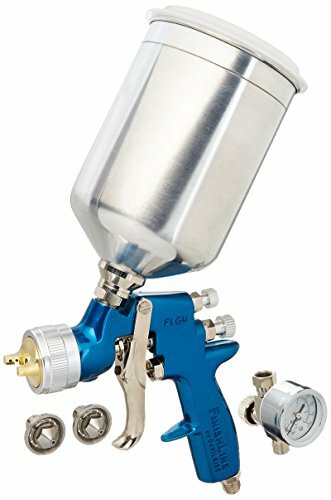 The 1.8mm Fluid Tip Gun is excellent for Primers, Oil Base, Latex, and other Medium to Heavy Viscosity Coatings. Use the 1.0 mm Tip Detail Gun for Tight Areas and Touchup. Another offering from TCP Global, but this one doesn’t come as part of a set. Instead, you get an HVLP spray gun that has a 1.3 mm fluid tip. There’s an air pressure regulator as well, so you can easily control how powerful the spray is. With a tip like this, you will get the most benefit from this product when spraying clear-coats or base-coats, and it has a 1-liter cup to fill up with the paint of your choice. It’s a very affordable product, and definitely one you should consider if you want to buy the best automotive paint gun for beginners. Largely because it has some useful features that make it very accessible to newbies. There are lots of control knobs that allow you to adjust different things on the gun. For example, you can alter the spray pattern and fluid control, which will enable you to play around and figure out how to get the best finish. Speaking of which, there’s a fully atomized spray, which gives a very consistent spray pattern. As a result, you can achieve a professional finish with very little fuss at all. The 1.3 mm Fluid Tip is Ideal for Optimal Atomizing when Spraying Base-coats, Clear-coats and other Light to Medium Viscosity Materials. 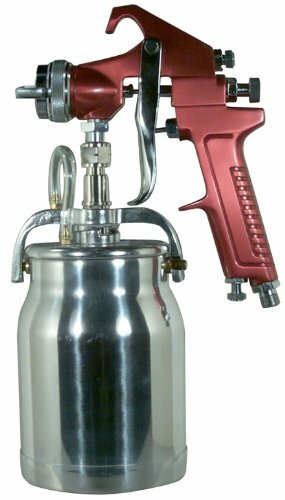 Spray Gun has Control Knobs for Full Adjustment over Spray Pattern, Fluid Control and Air Pressure. Contains a Stainless Steel Needle and Nozzle Set. Gun has a full baffle head assembly that enables it to produce a Fully Atomized and Consistent Spray Pattern for a Smooth Professional Finish! When you look at or hold these products, certain things tend to stand out right away. With the Neiko Gravity Feed Air Spray Gun, the first thing that comes to mind is durability. It’s got an entire steel gun body, and a nozzle made from stainless steel. Add to this a brass cap, and you’ve got something that really wouldn’t look out of place in a professional auto shop. The product we’re looking at has a 1.7 mm nozzle, but they do have other products with smaller and larger nozzles. With this sized nozzle, you have more flexibility and versatility as it can be used for loads of different projects around the home. You get three adjustable valve knobs that let you alter the spray pattern to your desires. You can make it tighter or wider, which can suit different painting jobs. It also has another valve where you can adjust the air pressure in your automotive paint gun so you can choose the desired power. Finally, you get a cleaning brush as part of the package, along with a multi-size wrench too. Both of these things essentially mean you can maintain the product and keep it working for longer. If you were looking for the best automotive paint gun for beginners based solely on looks, then the Astro 4008 would take the title! It’s got a beautiful red handle that really makes it stand out. Of course, looks aren’t important; it’s all about functionality and value for money. Here, you have a two-piece design featuring the paint cup underneath the nozzle. This makes it easy to take the gun apart and clean the two pieces on their own. Plus, the cup has a dripless design and a 1-quart capacity – so there’s no worry of any spillages happening. With a nozzle size of 1.8 mm, you have a very versatile product that can be used in many different settings. What’s truly amazing about this option is that the atomization is perfect. Combine this with an exceptional adjustable fan, and you can cover massive areas from a fair distance, and still get a consistent finish. Going back to the cup and its dripless design, this doesn’t just mean no paint will spill when you’re holding it upright. You can also hold it at any angle and have no fear of spillages or suction issues. All of these automotive paint guns for beginners offer something slightly different from one another. But, they have one thing in common; they’re way cheaper than paying a professional to paint your car for you! If you’re eager to buy the best automotive paint gun for beginners, then my advice is to make a checklist of features that are essential to you. Set a price range as well, and you’ll quickly be able to find your dream product by looking through the reviews above. So, make your decision, and save thousands of dollars on automotive paint jobs in the future! Copyright © 2019 NewToolsLab.com. All rights reserved.